We're recognised as industry-leading suppliers for bargain Samsung SCX-5530FN laser toner cartridges within Britain. You can't get it wrong with Cartridge Save with regards discount Samsung printer toners. It's no longer necessary to waste a long time hunting for Samsung SCX-5530FN toner cartridges in local outlets and then end up forking out more. To find the cheapest deals with our unbeatable customer support, choose Cartridge Save. You can be assured of comprehensive peace of mind when you place an order for brand new Samsung SCX5530FN toner from us courtesy of the cast iron money back policy, which comes as standard . We make it easier to save you even more money on toner cartridges as every order comes with completely free delivery, typically arriving the following working day. This multifunction device simplifies document printing, network integration, and business correspondence for small offices. The Samsung SCX-5530FN mono laser printer includes fax and scan functions with direct USB printing, but it does not offer full colour capabilities. The black and white Samsung SCX-5530FN multifunction printer can also be difficult to operate for inexperienced users. This is a boxy unit that stands 18 inches tall and measures 17.1 inches deep. It spans 18.35 inches wide, but more installation space should be provided in front for the 250-sheet cassette tray and 50-sheet multi-purpose tray. Up to 150 sheets can be accommodated by the output bin of the Samsung SCX-5530FN. An ADF is attached to the flatbed scanner. The main interfaces include Ethernet and high-speed USB 2.0. The control panel includes a two-line, 16-character LCD. Replacement toner cartridges for the Samsung SCX-5530FN can print either 4,000 or 8,000 pages in black and white. The Samsung SCX5530FN scans in colour and the copier has time and resource-saving features like collation, clone and poster copy, and ID copy. The print speed is up to 28ppm and when using the duplexer, it is up to 19ppm on A4-sized media. Sharp fonts and clearer images are printed in 1200dpi resolution. The Samsung SCX-5530FN printer can easily be installed in a network, and users can print files directly from a USB key. The display screen of the black and white multifunction printer SCX-5530FN is too small, while the control panel looks busy and overwhelming to operate especially for first-time users. 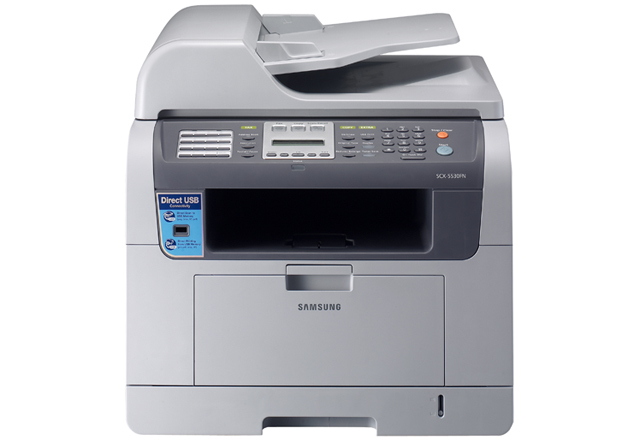 The Samsung SCX 5530FN laser printer may take up more installation space on a standard desktop. It only prints in monochrome and the fax function lacks full telephony functions.